The Israel Antiquities Authority said that archaeologists found a 2,000-year-old gold earring next to the walls of the ancient city, under what was a parking lot. This is not the first amazingly well preserved piece of jewelry found in Israel, but many jewish works of art are often found in other places (such as the earliest gold scroll found in Austria). 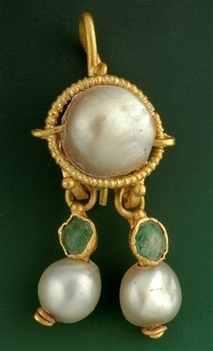 The earring is inlaid with pearls and emeralds and scientists estimated that it was crafted sometimes between 1st century B.C. and the 4th century A.D., which means the probable age for it is somewhere around 2000 years old. It was discovered by archaeologists which were excavating the ruins of a building from the Byzantine period dating from around the 5th century A.D. and they were amazed to see how well preserved the jewelry was. The authority says it’s very probable that the earring was crafted using a technique similar to that depicted in portraits from Roman-era Egypt.